The Gay Gamer: Can you feel the Theatrhythm? I sure can--or maybe I should say I'll be able to feel it soon, since Square Enix's Theatrhythm Final Fantasy is set to be released stateside sometime this summer. For those of you who've never heard of this game, it's a tap-and-swipe-the-touch-screen rhythm game--not unlike Nintendo's criminally under- appreciated Elite Beat Agents--that features characters and music from the Final Fantasy series. I've had my eye on Theatrhythm Final Fantasy since it was first announced (for Japanese release) last July mainly because of its oddly charming art style, although I'm attracted to its filled-to-the-brim-with-classic-tunes soundtrack, too. They also haven't revealed the Western version's box art, which I'm hoping will be an altered-as-little-as-possible rehash of the art that graced the cover of the Japanese release. 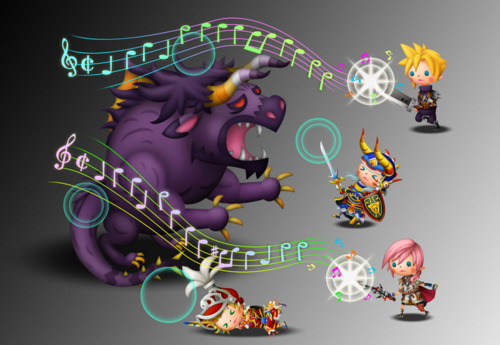 Are any of you similarly excited that Theatrhythm Final Fantasy will soon be available outside of Japan? I'm sure the cover will be tampered with, I mean changed. I'll certainly be keeping an eye out on this game! Don't say that, Igor. You'll jinx it! I'm going to be seriously disappointed if they screw with the box art too much. I mean, the Japanese box art is so pretty! Why not just leave it alone. I definitely wouldn't spend $1500 for a PC Engine LT -- even if it was CIB, etc. It's *possible* I'll eventually spend $600-800 on a "loose" PC Engine LT, but that's far from a given! I admit I skimmed through that post. Now c'mon, Fire Emblem: Awakening and Monster Hunter Tri G.
Oh, I'm going to have to check out Parko's blog, Phillip. Also, I love that you have a series of articles called "Localizations, Please!" Anyway, I'm glad to hear you're looking forward to this one, too. As for Fire Emblem and Monster Hunter 3G: I have a feeling both will come out here (in NA) this year. If FE is somehow passed over, though, I'm going to be REALLY pissed at NOA. I was thinking E3 is when/if NoA would announce it. Though, I have all of the Fire Emblem games released over here, and I've played zero of them. I think my OCD with my units dying for good and wanting to keep them all would drive me insane. Yeah, I'm thinking FE will be announced at E3. Probably in a rather subdued way, too -- as in, they won't announce it during their presser, but afterward they'll include it in their PR materials and on their website :| Still, I'll take what I can get. I'm way thrilled! I had no idea they'd said it was coming to North America. I had zero hope that it would make the jump...but that's awesome. Yes, SE released a press release about it on Thursday morning. Now they just need to give us a release date -- and a price! BTW, are you planning to pick up this one, Justin, or not? Well, I'm sure you know how I feel about this! Yeah, international FF releases do tend to have different covers, don't they, Anne? Still, I'm hoping this one will remain the same -- or at least not be too different. I also like the very minimalist covers the mainline FF games get in Japan, BTW. Like you suggested, though, I think they're just too plain for North Americans, especially. I think I will. I loved Elite Beat Agents, and anything that follows in its footsteps is good to me. Well, that's good to hear -- especially since I know you're in a PS3 kind of mood lately.